There is actually no McLain or Kyne. There is not even a distillery but, there is one man named Trey Zoeller Who founded the company in mid-1990. He grew up in Louisville, KY and then left for college. He later returned home and bought an amount of bourbon from an anonymous distillery (I have personal heard that the bourbon came from batches of Buffalo Trace (or at least some of it). The barrels came from barrel houses all over the distillery, some even from the “Van Winkle” barrel houses) . Jefferson’s Reserve and Sam Houston Bourbon was introduced in 1998. 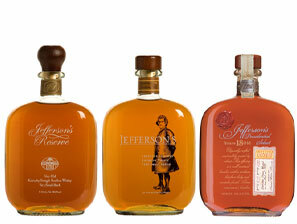 Two (2) more bourbons came out in 2003 named – Jefferson’s and Very Old Jefferson’s Reserve. Although there is not a McLain or Kyne at the company the names are from Zoellers’ family. His ancestors made Moonshine as well as his Grandmother “McLain”. She was once arrested for illegal distilling. The story is that she, like many others at the time, did not want to pay the high taxes in order to distill her favorite spirits. The date is 10-2-2011 and this is a bottle of bourbon that is quite unique that comes for Louisville, KY from a man named Trey Zoeller. The bourbon has not been distilled by him yet, purchased and bottled from anonymous sources. Yet, I have heard that the bourbon came from batches of Buffalo Trace (or at least some of it). The barrels came from barrel houses all over the distillery, some even from the Van Winkle barrel houses. This bourbons big brother, the 17 and 18 year old small batches and single barrels are noted to be from that very warehouse. Bottle No. – 1259 of 2400 – This bottle was picked for this very reason. It is said that the best bourbon is poured from the middle of the batch. The first thing I noticed is that the color is beautiful. The bottle is crystal clear and has a very nice wood turned cork topper. This bourbon has a Deep and Dark molasses hue with a rich reddish tint. Does not have much nose at all from the bottle. Very-Very slight hint of char and corn sweetness. There is a very distinct note of caramel and molasses right up front. Next is a hint of vanilla and smoky oak. The rye is a nice finishing note. This bourbon is a beautiful 90 proof. There is a simple bell curve affect to the palate presence. First, just a simple taste, then it evolves into a mouthful of mild to medium rye intensity and then goes away quickly but, enough stays on your tongue for an enjoyable experience. The flavors are notes of soft oak, smoke, and raisin, rye with hints of light pepper, wheat and nutty sweetness. Jefferson’s whole line has become a favorite of mine very quickly. This bourbon is a shining example of how great bourbon can taste. Being that it is a small batch; the mingled barrels and the age of them, complement each other to allow for a smooth, flavorful with a lasting finish profile. It is very easy to drink neat and is ok to add a dram of spring water or an ice cube. The water or ice can sometimes bring out a slight apple blossom note. This Very Old expression is much more complex than its younger brother but, that Small Batch expression is very nice and extremely easy to drink or sip with friends. Be on the lookout for its review in the future. 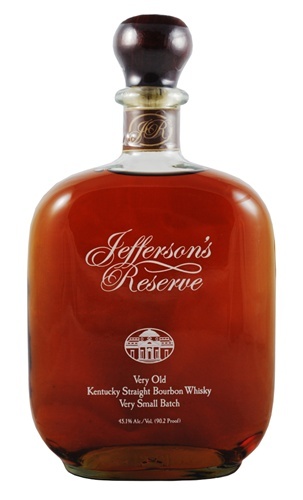 Jefferson’s Reserve Very Old Bourbon has a delicate scent of red fruit, rye bread and oak resin that leads to a rich, tangy palate with wood resin, corn mash and dry cereal. There will be a new review about every week. Stay tuned in for future reviews. Please write if you have a specific bourbon you would like a review on next! On first taste I fell in love with the gentle flavor of Jefferson’s! As a Bourbon lover I am constantly trying various bourbons, but I have found a “New Favorite” in Jefferson’s! I would love to visit the business on my way through Louisville on my way to Myrtle Beach at the end of the month.